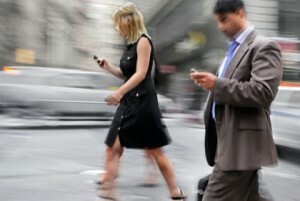 You’ve probably done it once or twice—snapped a photo, or sent a quick text, while walking. Chances are, nothing happened. But recently, one incident turned tragic. Thirty-three-year-old Joshua Burwell was likely taking a photo with his cell phone before falling to his death last week at San Diego’s Sunset Cliffs. His death has drawn attention to distracted walking, the increasingly common practice of walking while staring at an electronic device such as a smartphone or tablet, as CBS News reports. As cell phones have become more popular in recent years, the incidence of injuries related to distracted walking has risen. In 2010, more than 1,500 people were treated in emergency rooms because of distracted walking, according to a 2013 report from Ohio State University. The number has increased six fold between 2005 and 2010. Some tragic cases, like Burwell’s, have resulted in death. 2. Although many people know that distracted walking, distracted driving and distracted sleeping are health and safety issues, they’re having trouble quitting the habit. Please give your comments on the following suggestions to combat distraction. Also provide other suggestions if you have any.